The latest round of polls has produced a batch of collectively bad numbers for President Bush, the Congress, the direction of the country and the Iraq war. They also show troubles for front runners. And opportunities for others. President Bush returns from his European trip to find yet more new lows in individual polls but more importantly a new low and a continued sharp downturn in my estimated approval trend, which now stands at 31.0%, well below his previous sustained low of 34% in December-March. The current downturn started April 24 and continues unabated. In the figure above I add the more sensitive estimator ("Ready Red") to the standard more conservative ("Old Blue") estimated trend. Since April the two estimates overlap almost perfectly (making Red seem to disappear under Blue in the graph.) 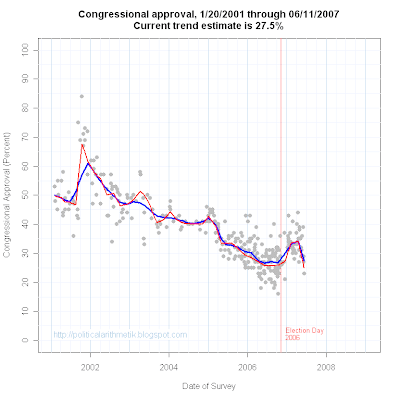 This means the current change in approval is not a fluke-- regardless of how I estimate it, the trend is the same. That suggests that the current downturn continues at a steady rate, otherwise Red and Blue would disagree near the end. 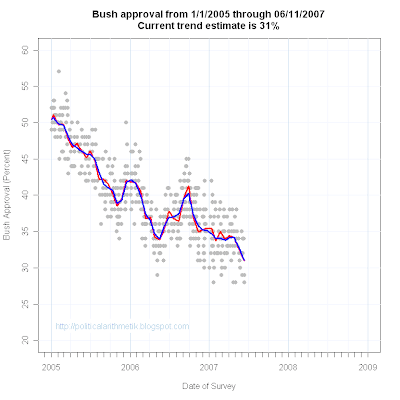 Bush reversed a previous downward trend in February-May 2006 with a speech in support of immigration reform. Is it possible that his trip to Capitol Hill to meet with Republican Senators will do any good? Or has the time for him to rally a consensus on immigration now passed? I think it has, despite what was once a clear opportunity for him to gain support. But gloom and doom doesn't stop with the President. Congress has taken some hard knocks in the last month as well. The two latest polls, from NBC/Wall Street Journal and Quinnipiac University both peg approval of Congress at 23%. That comes on the heels of the LA Times/Bloomberg finding of 27% approval. The trend started down for Congress on April 15, but shows no sign of slowing. The trend estimate now stands at 27.5% approval. And Red thinks it might be lower still. I think Red is overreacting to the two polls at 23% and Blue is probably a better estimate. But gee-whiz either way. Democratic supporters have been quick to point out that opinion of Congress is not the same as approval of Democrats in Congress. I made that same point here and provide regular updates of the party evaluations here as well. But I think that argument is beginning to take on a bit of desperation and denial. There is good evidence that Republicans in Congress remain less approved of than Democrats, but there is no evidence that Democrats are gaining in approval from their recent actions. The polling here is thin, with approval of the parties only asked occasionally, so it is hard to track short term change. But the evidence we have is that Democrats are suffering declines in support relative to their January numbers. There is some evidence that this loss of support comes significantly from their base among liberals, who are unlikely to shift to support of Republicans. But an unpopular Congress has been the undoing of majority parties before and it seems Democrats should pay attention to the decline in approval of Congress, not whistle past the graveyard by pointing out that Republicans are worse off still. Profound pessimism about the direction of the country continues at amazing levels. 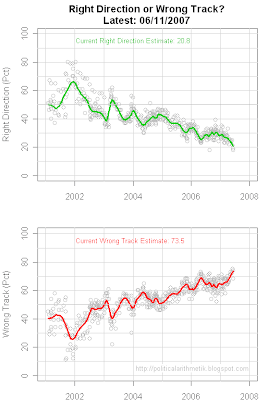 The trend estimate has sunk to only 20.8% saying right direction and 73.5% saying wrong track. Even if we discount for the artificially high levels of positive feeling following 9/11, the decline has been profound and sustained. With all this gloom, where is the politician with the skill to take advantage by offering some attractive alternative? Ronald Reagan with a happy vision of a shining city on a hill (with low taxes) or Bill Clinton saying the economy can be better. Who can capture the public's confidence that they can move the country in a new and better direction? At the moment, the front-runners seem to be failing to seize that opportunity. Instead, the momentum in both parties has stalled for front-runners and turned to non-candidates. The Republicans provide the strongest example of a party unhappy with its choices. Both Giuliani and McCain have suffered significant losses over the past 3 months. Now the excitement is behind the not-yet candidate Fred Thompson, who has gained sharply in the last month to near parity with McCain. The evidence is pretty good that Thompson's surge is not a fluke of a single poll or two, but is widespread across polls (though we could use some more to be sure!). This kind of surge for a new candidate is typical of what we see when there remain a significant number of partisans not happy with their choices and looking for any more attractive alternative to the front-runners. We saw this most famously in 1984 when Democrats unhappy with Mondale jumped on the Hart bandwagon once they saw the possibility of a credible alternative. At the moment, I think that is Thompson's greatest strength-- the hope of a better alternative. As Hart shows, it is not enough ultimately to be "not-Mondale", but at least for a while Fred Thompson may benefit significantly from being "the" alternative. Once in the race, can he take advantage of a discontented public? Does he have a story to tell about how to make America better? I have to add that Mitt Romney is looking like the steady tortoise to the other hares. His trend has remained steadily up despite a number of mistakes earlier. He hasn't enjoyed even a moment of Thompson's "surge", but he's also escaped downturns. His current Iowa and New Hampshire polling also looks good. He has a very far ways to go to emerge in first place, but this far out you might like that long term positive trend. The Democratic frontrunners haven't suffered the sharp declines that Giuliani and McCain have, but none are showing strong positive gains either. 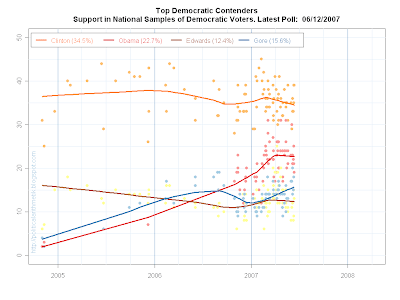 Clinton has fallen off just a few points recently, Obama seems stalled and Edwards has a very slight decline in support. So who do Democrats like more and more? Al Gore, the non-candidate. 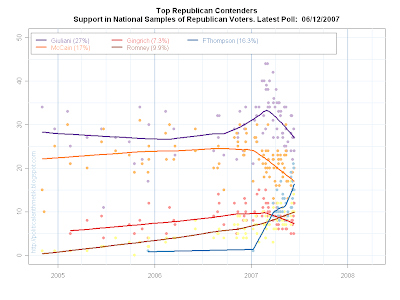 The Gore increase is no where close to that of Fred Thompson, but of the four possible nominees pictured above, he is the only one with steady gains throughout 2007. Given the low level of encouragement Gore has given to a possible candidacy (FAR less than Thompson) it is remarkable that he's moved up at all. And while the Thompson candidacy looks increasingly likely, a Gore campaign seems a remote possibility to me at least. Nonetheless, a non-trivial number of Democrats are looking longingly at him while passing up the easy opportunity to support Clinton or Obama or Edwards. Clearly they are looking for someone else who can take this opportunity to exploit the moment. Other evidence (here and here) makes Gore seem an unlikely white knight. In terms of partisan feelings, polarization and support in a general election, Gore looks a lot like Clinton-- well known and well liked among Democrats but not very popular among independents and actively despised among Republicans. But that isn't the point here. He is "someone else" at the moment within the Democratic party. The front-runners have won substantial support within their parties and one may yet go on to win. But the current flatness or decline in their support trends argues strongly that none have sealed the deal with their primary voters. The widespread public disaffection with current leaders and conditions can be seen as a difficult environment to run in. But it is also the great opportunity to be seized by an able politician, one who can convince supporters that they have a vision of how to lead the country out of these bad times and into a new "morning in America". Based on the evidence here, I don't think any of the top six candidates has managed that yet. And that leaves them all vulnerable to someone who can. Fred Thompson is evidence that it is not yet too late for such candidates to emerge.